The Royal Sydney Philatelic Club was founded on the 21 January 1890, a foundation member of the Philatelic Association of NSW (Philas). Members are entitled to participate in the Club's Exchange Book Service as buyers and/ or sellers. Members may borrow books and journals from the Library on application to the Librarian. "The Quarterly Journal" of the Club is posted free to all members. 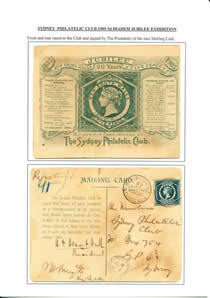 View the 100 page exhibit, Royal Sydney Philatelic Club Archives. 2nd Tuesday of the month (except January) at 7:00pm. The room is open from 6:30pm to permit informal discussion of matters of common interest. Philas House (1st floor), 17 Brisbane Street Surry Hills NSW 2010 (see map below ). Annual subscriptions are due on the 1 July. Philas House is near the southern end of Hyde Park, Whitlam Square, and Museum Station. Catch a bus bus to the first stop in Oxford Street from Central Station and Circular Quay. By Car- Brisbane Street is one-way from Oxford Street to Goulburn Street. Limited street parking is available, or the Goulburn Street Public Car Park is two blocks away.